A pipe used to feed gas into a Stoke-on-Trent mosque which was then set alight had been stolen from another area of the city, police said. 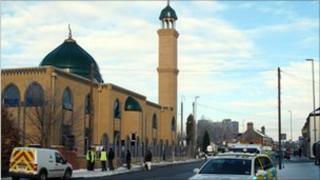 The incident at the mosque in Regent Road, Hanley, on 3 December, is being treated by Staffordshire Police as a racist attack. The yellow pipe was stolen from the Limekiln/Bucknall Road area. Police said tracing the pipe was one of several lines of inquiry. Five people have been arrested during the probe. Ch Insp Wayne Jones said the attack had caused "a great deal of upset" in the community. "A great deal of work has been undertake since the fire almost three weeks ago and that work is very much ongoing as detectives pursue several positive lines of inquiry," he said. Officers were called to the mosque at 0630 GMT after live CCTV footage showed smoke emerging from the building. A gas pipe had been fed from a nearby building through a window at the mosque.